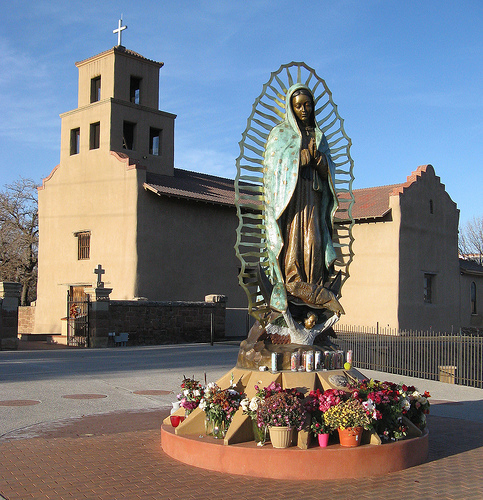 A humble adobe structure built by Franciscan missionaries between 1776 and 1795, this is the oldest shrine in the United States to Our Lady of Guadalupe, patron saint of Mexico. There’s a priceless 16th-century work by Venetian painter Leonardo de Ponte Bassano and a portrait of Our Lady of Guadalupe by the Mexican colonial painter JosÈ de AlzÌbar. Other highlights include a traditional New Mexican carved and painted altar screen, a 19th-century sacristy, a pictorial-history archive, and a library devoted to Archbishop Jean Baptiste Lamy. Hours: May-Oct. Mon.-Sat. 9-4; Nov.-Apr. weekdays 9-4.